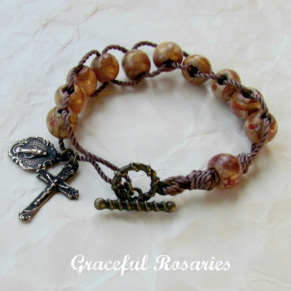 Handmade Rosary Bracelets are a beautiful way to carry the rosary with you throughout the day. They are a beautiful statement of Faith. Custom sizing and custom clasp choices available. Bracelet lengths are measured from the base of the clasp, so the actual clasp is not included in the length. Keep in mind that the bead sizes reduce the inside circumference when the bracelet is wrapped around your wrist. The accurate way to determine your own bracelet length: measure the circumference of your wrist and add one inch. 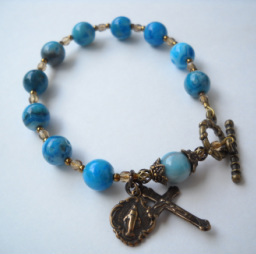 Click on a link below to visit the rosary bracelet page of your choice.